After a lacklustre 2018, can a triple-camera setup be the key to script Apple’s iPhone comeback? UPDATE: Tipster @IceUniverse also confirmed the leaked renders are indeed correct. Apple plans to use a triple-camera setup housed in a square camera unit with a rather large camera bump. Note that this is an early look at the upcoming smartphone and could undergo some more changes in the design. Apple’s planned expansion into a three-smartphone model wasn’t exactly rewarded in 2018 as the company’s shares dipped 12 percent in December, but the Cupertino-based company has a history of bouncing back. While it’s still too early to judge the fate of the iPhone XS, iPhone XS Max and the iPhone XR, we can now confirm that Apple will launch three new iPhones in 2019, continuing the current lineup. We have gotten our hands on a very early look at the 2019 iPhone thanks to a partnership with @Onleaks. This is in fact the very first look at what Apple is up to and by the looks of it, the next flagship iPhone will have three cameras on the back. The leaked renders reveal a square camera unit housing three cameras aligned non-linearly. There are two cameras aligned vertically, similar to the iPhone XS. The render reveals there will be a third camera placed between the two, on the side. Above that is an LED flash and a microphone on the bottom. OnLeaks claims the 2019 iPhones are still in Engineering Validation Test (EVT) stage, and there could be changes in the details when the phones will eventually launch in September 2019. We also know that Apple plans to launch three iPhones in September 2019 -- One low-end variant, possibly the successor to the iPhone XR and two high-end variants, succeeding the iPhone XS and the iPhone XS Max. Not knowing the scale at which the image was rendered, it is difficult to say which variant will sport the three cameras. 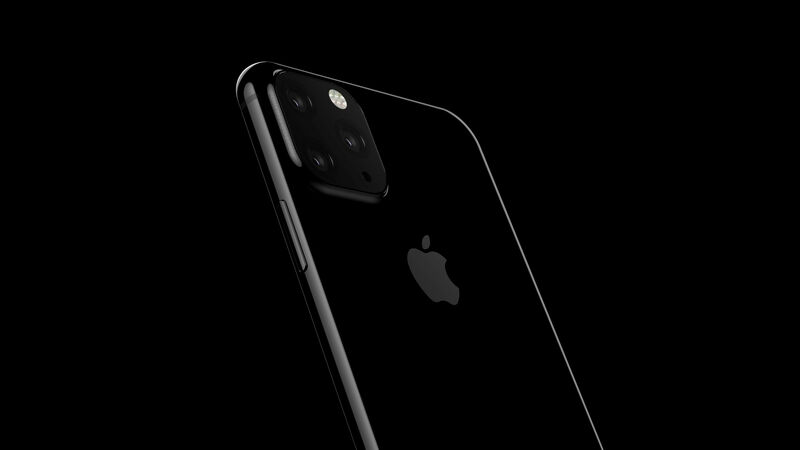 However, given the drastic change in the camera setup, this, most probably, is our closest look at the top of the line 2019 iPhone. The fact that the 2019 iPhones may have three cameras is cross-referenced by an earlier report by Bloomberg that states Apple will adopt long-distance 3D ToF technology on the 2019 iPhones. With a non-aligned camera module on the back, Apple could adopt the technology for the rear camera, similar to the Oppo R17 Pro. ToF or Time of Flight technology relies on how much time light takes to bounce off an object to create a 3D map. Sony is presently manufacturing 3D sensors for the technology, and the Bloomberg report stated the publication spoke to Sony to confirm the news. The leaked renders, as a result seem to be accurate to the information available so far. “Cameras revolutionized phones, and based on what I’ve seen, I have the same expectation for 3D [cameras],” Satoshi Yoshihara, Head of Sony’s sensor division told Bloomberg. Sony plans to ramp up the production of rear and front facing 3D ToF sensors to meet the iPhone demand. The production is expected to kick start late summer. The third camera can be used to focus faster on the object, and to create 3D models. It can track objects even in dark almost instantaneously by throwing laser pulses at the object and measuring the time taken by the laser to bounce back to the sensor. The sensors can have an even bigger impact in AR and VR. Sony claims the ToF sensor can be used to map rooms in real-time. In a demonstration, the report claimed Sony showed the camera can be used to track user’s hands in a game, like casting a spell. The 2019 iPhones are still nine months away from becoming available. And while we can confirm the flagship smartphones will use a new technology to improve photography, the design itself is not final. 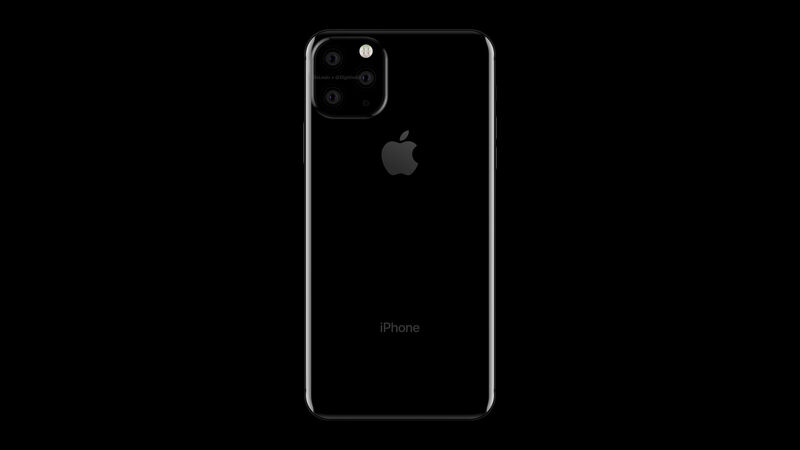 However, the renders reveal the black-coloured rear panel will be made of glass (the shine around the edges denotes that). The Apple logo will remain the centre of attraction though, positioned in the top centre. An earlier report also claimed Apple will not have a major design revamp. Tipster Ice Universe had noted in a Tweet that Apple will stick to using the notch in 2019 and in 2020, the company is expected to launch iPhones with punch-hole displays. While the presence of three cameras certainly sound impressive, it is likely to push up the cost of production further. In a teardown of the iPhone XS Max, it was noted that the bill of materials of the 256GB 2018 flagship iPhone was $443, as compared to the $1243 price tag it fetches in the US. Knowing Apple and its affinity to use high-quality components, the cost is likely to increase further. Now it remains to be seen whether that will affect the price of the 2019 iPhones. Apple reduced the forecast of iPhone sales for the upcoming quarterly report after lower-than-expected sales in 2018. The company has introduced price-cuts and trade-in incentives to boost sales of the 2018 iPhones. Many analysts believe the ongoing trade war between US and China have hurt iPhone sales in China, while the high price of the iPhones in India have led to a lacklustre response in the world’s second largest smartphone market. It remains to be seen whether by adding a third camera to the setup (and making the iPhone look extremely ugly in the process), Apple can bounce back from a disappointing 2018. The company has done it multiple times in the past, and as the leaks suggest, a three-camera iPhone will be the key to company’s comeback plan. Should i buy the device or not. Please help. It is a 8gb model and I want to use it a secondary device. It comes with 6 months seller warranty. Also I am buying it from gobol.in. Please help me in taking the decision.Read more.. I want to buy a Mac for learning Xcode and ios development is it good to buy top end mac mini model? What is its price in apple stores in Pune? Online price is around 80000 that also not available on most sites please suggest Read more..
Apple pay a new payment system is launched by apple .How will it work?What would be its merits and demerits? which was the first tablet made in world? Which phone is better s6 or iPhone 6 for long term use ?? Both have metal body, please tell me which is better ?